What's New @ Roselle Public Library: Support Library Supporters! The Roselle Public Library Foundation, a 501(c)(3) not-for-profit corporation, was created to ensure that the Roselle Public Library is not just another local library, but an excellent library for our community. The Foundation's objectives are to provide, enhance and enrich the programs, services and facilities of the Library to meet the challenges of tomorrow. We would like to recognize the many companies in our community that have chosen to support these objectives with generous donations in response to the Foundation's 2010 appeal. 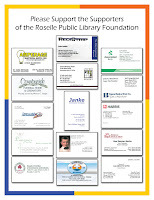 Please support the companies that support your Library through the Roselle Public Library Foundation.